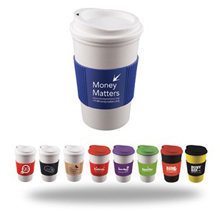 Our Reusable Branded Thermo Mugs with lid are the new way to advertise your Company branding in style! Double-insulated and thermal, keep those hot drinks - hotter for longer and personalise with your own corporate branding, print and logo - why not even add your contact details around the rubber sleeve grip? It's fantastic, with a secure screw lid and take-out style. Our new Reusable Branded Thermo Mugs with lid are custom to your chosen colour choice and personalised branding around the rubber sleeve. Hand out a batch for long lasting promotional advertising and you can't lose! For a FREE QUOTE, please fill in the form regarding our Reusable Branded Thermo Mugs with lid and we'll be able to help you.